Held the last Wednesday of each month from 9:30am-12:00pm in Herrington Hall. *Next meeting is Wednesday, March 27th. VISION – A world where every woman & girl has ready access to hygiene solutions. Hygiene solutions are a little thing that becomes a big thing quickly, when millions of women and girls suddenly have what they need to stay in school, pursue opportunity, and succeed. 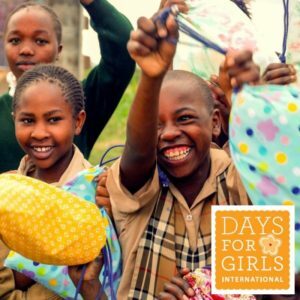 Days for Girls envisions a world where menstruation is no longer a source of shame and taboo. Through volunteers, enterprises, and public & private partnerships, Days for Girls is working to shift how women & girls see themselves and are seen by their communities. We offer new life choices, through providing sustainable hygiene solutions, health education, and income-generation opportunities. There are a lot of things that are hard to change in the world. This isn’t one of them. Join with us, and show what’s possible when we work together on behalf of women & girls. ALL WELCOME – whether you sew or not! Heather Skeates leads this new outreach program.